Christmas has been at my cousin Stephanie's place for the last 7 years. She makes a huge, elaborate holiday meal for the entire extended family, and her dinners are a lot of fun. Her Christmas dinner is the one event that CK looks forward to every year. Sadly, she has decided to spend her Christmas out of town this year, which means we're all on our own. Because we've relied on her so much, we're all scrambling trying to figure out what to do. 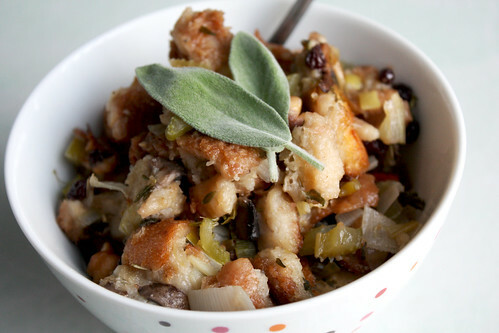 My small contribution this year is the stuffing. The first time I tried this recipe, my chestnuts blew up, and I spent hours cleaning the tiny bits of chestnut splattered all over my oven. I had an awful time cleaning the mess I made. I finally figured out a proper way to roast chestnuts, and I must thank Duane Keats for that. He told me to first soak the chestnuts, and then roast them for 40 minutes on low heat (approx 150-200F). His instructions worked perfectly. I did use a sharp knife to cut an X in each chestnut before baking to allow steam to escape...juuuuust in case. 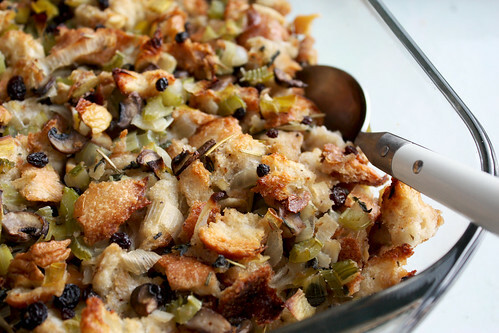 This stuffing is awesome. It is bready on the inside, and slightly crispy on top. The chestnuts and currants add a nice hint of sweetness, and the spices add a comforting taste. Try it, you won't be disappointed. I wish everyone a splendid holiday, and a happy new year! 1. Pre-heat the oven to 300 F/150C. Place the bread pieces on a baking tray and bake for 15-20 minutes, or until fully dehydrated. Another way to dry the bread pieces is to leave them out over night. 2. In a lightly buttered pan, sautee the onion, leek, shallot, sage, rosemary, and finely chopped thyme until the onions are translucent. Add the celery and mushrooms, and sautee for another minute or two. Add the chicken broth, a sprig of thyme, a pinch of cinnamon, and a pinch of nutmeg, and allow the broth to come to a boil. Add salt and pepper to taste. The broth should be slightly salty so that it is not bland when added to the bread. Turn off the heat, and discard the sprig of thyme. 3. Pre-heat the oven to 350F/180C. Grease a 9x13x2 rectangular baking dish with butter, and set aside. In a large bowl, slowly add the broth mixture to the dehydrated bread. Add milk, dried currants, and chestnuts. Mix well. Be careful not to break the bread pieces. Spoon the bread mixture into the greased baking dish. Bake uncovered for 35 - 40 minutes. Poor you!! But you managed to clean the oven.. start over and make this beautiful stuffing.. That could be my meal.I wish you Happy Holidays too and I look forward to reading and seeing more in 2010:) Thank you. Thanks for posting, i am going to make this for our dinner on Xmas. i was looking for a good recipe.